Wow! It’s been a while since my last post. Sorry about that! I’ve been super busy, but don’t worry I’ve been preparing a special surprise for you all during my hitaus, just wait! Though, until its revealed, let’s catch up! Okay, so here’s a teensy hint about the surprise: It’s dangly and retro! On May 6, 2011, 2NE1 released a new set of cf’s for their endorsement of scooter line,Yamaha Fiore. For the cf the girls are dressed in classic 2NE1 attire, bold and fun! 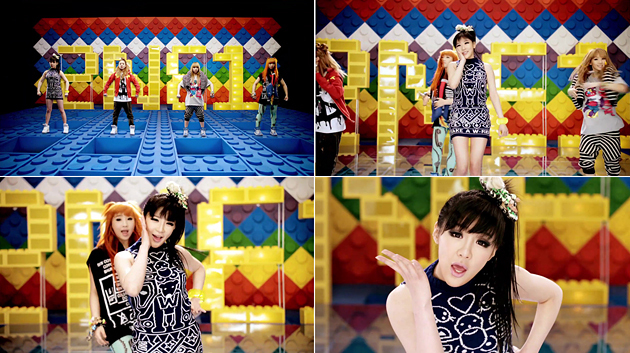 All the girls look great, but my favorite look is worn by song bird, Park Bom. She rocked the bold Cathy Sweater in Highlight from the recent S/S Cheap Monday collection, retailing at $60.00 at Karmaloop.com. She also rocked my favorite jean of all time, the Cheap Monday Camo jean. Karmaloop no longer carries it, but PLNDR occasionally has it in one of their many sales. Last week the jean retailed for just $22.99, though in order to access PLNDR you must become a member here. My screen cap is quite embarrassing, but I just had to post this as soon as possible! I’ll update with a better photo once one is released. Check out the cf for a better look of her outfit. This is my ideal outfit. Simple, bold and chic. Did you like her look? On the April 22nd 2011 airing of Music Bank, f(x) made their long-awaited comeback with their performances of their title track Danger as well as Gangsta boy. For their Gangsta boy performance they girls wore harem pants and accessories from the popular Spring / Summer 2011 Joyrich collection. Unfortunately not all the pieces have been released for sale yet, but luckily Karmaloop has a few pieces available. Luna wore the Cat Embossed Joy Cap in Leopard, it retails for just $32.00! Amber wore the Boy Cut Off Hoodie, it retails for $80.00. As always rep code Kstyle saves you up to 20% off your purchase! Free Shipping with orders $50 or more with code 50ship too! I can’t wait to see more of the girls. Who rocked your favorite look? If you follow me on Twitter then you already know about my feature on my favorite blog, What The Hellz. I have been following the blog for some time now for the latest Hellz news, Brittany’s tell it like it is posts and of course the Hellz-A-Poppin’ Watchu Rockin’ fashion posts. So it made me all giddy inside,to check out the site and see my outfit submission as the latest Hellz-A-Poppin’ Watchu Rockin’. Check it out below! Back in December 2NE1 released a track, Don’t top the music as well as a music video for an endorsement of Yamaha Fiore scooters. 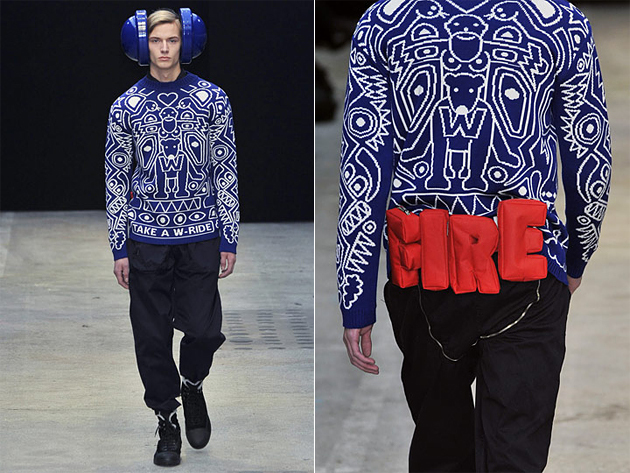 Main Vocal, Park Bom brought the fire, with her printed sweatshirt from the Walter Van Beirendonck Men’s Fall 2010 collection. Of course it was altered for a classic Bom fit…barely there. 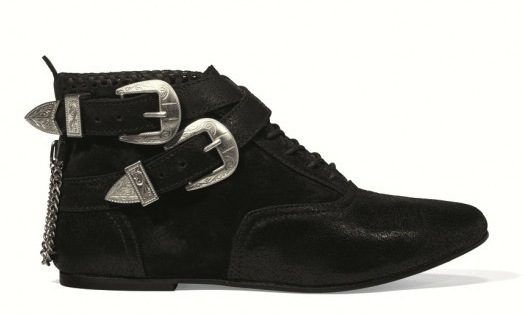 As for her shoes, she wore the Beverly Hills Plate sneakers from the Adidas x Jeremy Scott Spring Summer 2010 collection. I thought she looked adorable. What do you think about her look?